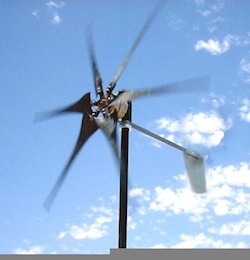 I bought a Wind Scorpion wind turbine to augment the solar panels in the off-grid power system I use for my cottage. At the northern latitudes where I live the solar panels get covered with snow for most of the winter. This meant that there was always the danger that the batteries would get run down and freeze, which would ruin them. 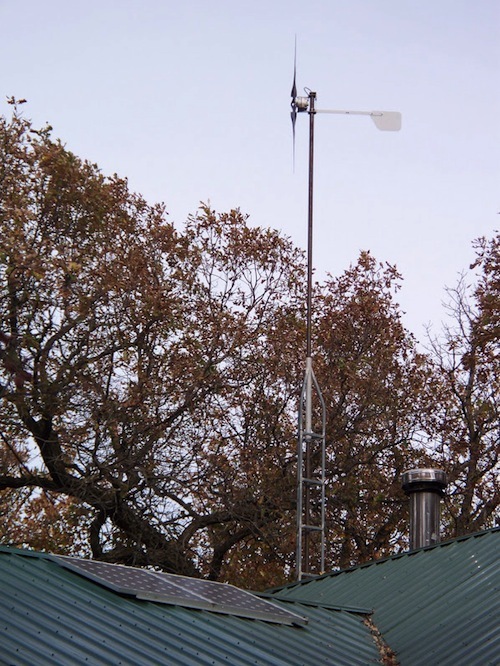 A wind turbine looked like a good option and Thermodyne Systems had what looked like the best bang for the buck. I installed it last year, and so far it has run without any problems. I was concerned that it would be noisy, but the noise at full speed is equivalent to an electric induction motor running, which is okay. It’s cool to look up and see it spinning away generating electricity. The turbine itself costs around $500 shipped, but you also need a tower and wiring. I used an old TV antenna tower and a length of pipe. The tower was free and the material and shipping brought the total cost to about $750. This is for the add-on to an existing solar system. If you are starting from scratch, the solar panels, charge controller, batteries and inverter for a small system will set you back a minimum of $1,800. That and your free labor is the cost of not having an electric bill in your mailbox every month. The result looks a bit jury rigged, which I take a perverse pride in. You need to a have knowledge of electrical and construction technology together with tools and skills to do it yourself. Raising a 40′ tower requires planning and a bit of overarching self-confidence. A similar system I looked at that was put together by a professional contractor reportedly cost over $15,000. I am on the lookout for more tower sections so I can raise the turbine up another 20 feet to catch more wind. The challenges never stop. Thermodyne operates through their website and pride themselves on being paperless. Email inquiries were promptly answered and the order was shipped the next day. There are competing wind turbines, but I haven’t had any experience with them. They look more finished, but the advertised prices are about double for a machine with equivalent output. Brian's wind turbine at home. Hello friend! If this is your first visit to Cool Tools you may not realize how much great stuff is here. • In addition to this item, there are over 3,700 other cool tools reviewed and recommended here. We cover an insane range of items from hand tools, how-to-how books, educational toys, maps, apps, and all kinds of other unexpected goodies. Every weekday (for the past 14 years!) we publish an unexpected cool tool review. Take a look at the Editor's picks as a start. 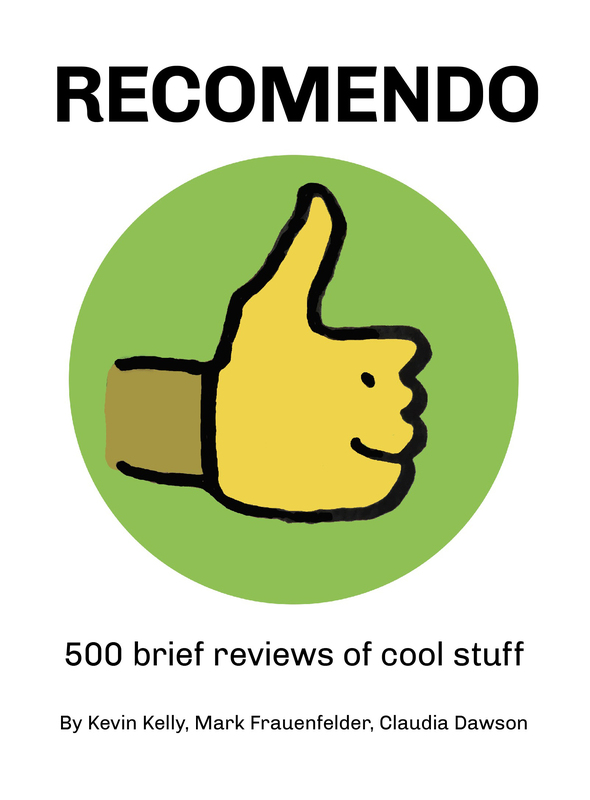 • Every week we email out 6 brief recommendations of cool stuff. Now up to 10,000 subscribers, Recomendo is one of the most popular things the Cool Tools team produces. People really enjoy the brevity and usefulness of these little notes. Signup or inspect previous issues here. • We produce a weekly 20-minute podcast where a legendary maker shares his or her favorite 4 tools. • We co-host a weekly 30-minute video round up of the best maker-oriented material on the web. No matter what kinds of things you make or make happen, we bet you'll find some help here.